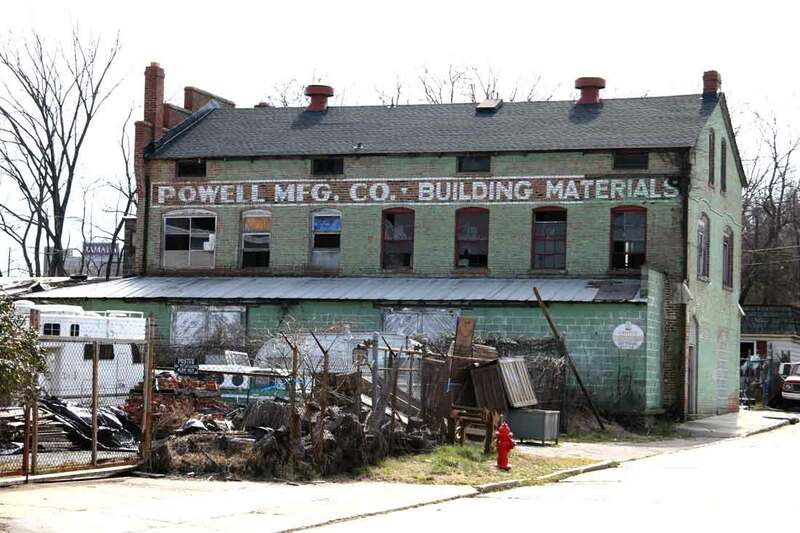 The Powell Manufacting Co. was founded by Raleigh Cox Powell (1887-1953), a Petersburg native, in 1927. They were located in this building on the northeast corner of 4th St. and Henry St. which had the address 229 4th St. They were building contractors and manufactured building materials. Raleigh C. Powell first appears in Petersburg city directories in 1905 when he lived at 151 High St. In 1907 he appears as a clerk at Virginia Trunk & Bag Co., then in 1911 as secretary-treasurer of Harrison Construction Co. in Petersburg. His occupation in 1917, when he registered for the World War I draft, was Building Superintendent, Harrison Construction Co., Petersburg, Va. Harrison Construction Co. were general contractors and engineers, who became Harrison-Hazlegrove Co. Inc. in 1927. Raleigh C. Powell was born 14 January 1887 in Petersburg, Va., and died, age 66, 15 August 1953. He lived on Jerusalem Plank Road in Prince George County, and burial took place 17 August 1953 at Blandford Cemetery, Petersburg. This was Powell's graduation photo in The Bugle, Virginia Polytechnic Institute, 1936. In 1952 president of Powell Mfg. Co. became Samuel Goode Jones III (1916-2011). His obituary pulished in the Petersburg Progress-Index 15 January 2011 read in part, "JONES, Samuel Goode III, a native of Petersburg, Virginia, born August 27, 1916, died at Rappahannock Westminster-Canterbury in Irvington, Va. on January 13, 2011. A retired contractor-design builder, "Sambo" Jones attended VPI (Virginia Tech, Class of 1939) in Blacksburg, majoring in mechanical engineering. Following graduation, he was employed as an automotive test engineer at the General Motors Proving Grounds in Michigan. He then served with the U.S. Army in the Ordnance Dept. as instructor in maintenance of light tanks, stateside and overseas (1941-1945). Mr. Jones worked for the Powell Manufacturing Co. Inc. of Petersburg before establishing his own construction company in 1951, known as the Jones Boys. An avid bird-hunter he also enjoyed fishing, boating, sailing and swimming. For many years S.G. Jones served as an Elder at Second Presbyterian Church in Petersburg, and later as one-time Junior Warden on the Vestry at Trinity Episcopal Church in Lancaster, Virginia. One of five boys of Elizabeth Stribling Jones and Dr. Claiborne T. Jones, MD, S.G. Jones III is survived by one brother, James Bolling Jones of Chester, Va. ... Among his ancestors of note were Colonel "Hell Cat" Jones of Revolutionary War days and the Rev. Edwin Burwell Jones, MC, both of Brunswick Co., Va. A memorial service will be held 11 a.m. Friday, January 21, 2011 at J.T. Morriss and Son Funeral Home, Petersburg Chapel, with interment ceremony to follow in Blandford Cemetery, Petersburg, Va."
Contrary to the obituary, the "The Jones Boys" was an informal name for Powell Manufacturing Co., as witnessed by this ad from Hill's Petersburg City Directory 1955. Another of the Jones boys was John Ravenscroft Jones (1920-2007). The following notice is availabe at http://articles.dailypress.com/, "John R. 'Davy' Jones February 4, 2007 HIGH POINT, N.C. — Mr. John R. 'Davy' Jones, 86, of Bena, Va., died Saturday at High Point Regional Hospital. He was born Aug. 5, 1920, in Petersburg, Va., a son of the late Dr. Claiborne Jones and Elizabeth Stribling Jones. A World War II veteran, Mr. Jones was a tank commander in the 5th Marine Division and was in the first tank ashore at the Battle of Iwo Jima. He received the Silver Star for gallantry at Iwo Jima. After leaving the Marine Corps, Mr. Jones was a building contractor and owner of Powell Manufacturing Co. in Petersburg, Va. He was an active member of the First Presbyterian Church of Gloucester, Va. In addition to his parents, Mr. Jones was preceded in death by his wife, Viva Lea Jones, in December of 1995, and a son, Claiborne Jones, in April of 1995." A third Jones boy was James Bolling Jones (1923-2012). His obituary read in part, "James Bolling Jones, Sr., 89, of Chester, passed away on Thursday, September 6, 2012. Mr. Jones was a pilot in the United States Air Force from 1949 to 1953, a flight instructor for air force cadets from 1953 to 1956, a partner in The Jones Boys Inc. in Petersburg from 1956 to 1975, a teacher in Dinwiddie from 1975 to 1988, and a full- time civilian flight instructor from 1988 to 1996, finally reaching the goal of 10,000 flight hours. Mr. Jones moved back to Petersburg in 1957 and became a member of Second Presbyterian Church and was active in many activities there, including serving as an elder and Troop 175 Troop Committee Chairman for eight years. He resided in Petersburg, Virginia, from 1957 to 1987 when he moved to Chester, Virginia. On June 13, 2010, he joined Grace Lutheran Church in Chester. Mr. Jones is preceded in death by his parents, Anne Elizabeth Stribling and Dr. Claiborne Turner Jones of Petersburg; four brothers, Dr. Claiborne Jones, Samuel Jones, Charles Stribling Jones and John R. Jones. ..."
It is unclear when Powell Mfg. closed for business. References to the "Jones Boys Inc." appear in the Progress Index as late as 1971. A later business of this same name (apparently established 2007) was located at 230 East Bank St., and a number of photos of the above building at 4th & Henry appear on the internet mistakingly identified as 230 E. Bank St.